How many dead civilians were represented in the first row of George HW Bush’s funeral? Above, mourners at George H.W. 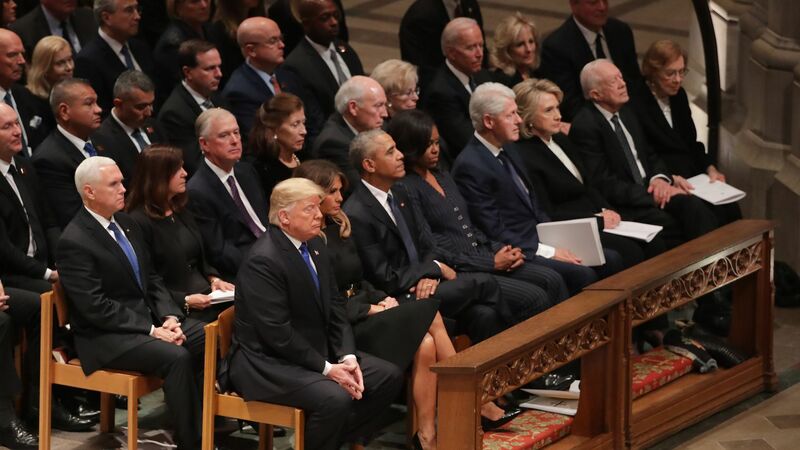 Bush’s funeral include all the living former presidents and their wives, plus Donald and Melania Trump. This photo represents so much grief to me. So much death. 6,979 soldiers killed in the Global War on Terror. 383 soldiers dead in the Gulf War. Smaller numbers of military casualties almost too numerous too count under Carter, Bush I and II, Clinton, and Obama. 200,000 indigenous people dead and 1.5 million more displaced in Guatemala in a genocide that began during Carter’s term; under his leadership, the US failed to sanction Guatemala as the nation began a campaign of terror against peasants. We supplied training for military leaders, and tanks from Israel, subsidized with US war money, were used in the violence there. 75.000 civilians dead–85% of them at the hands of the government–in the Salvadoran Civil War. Carter’s administration gave at least $5 million, plus training, to in aid to the government. Among those dead were priests working for piece, including Oscar Romero. Note that Reagan, whose interference in Latin America is a direct cause of so much suffering today, isn’t even in this picture. 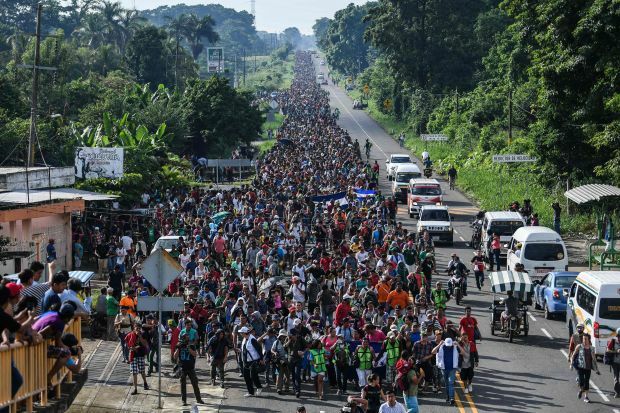 Those seeking asylum in the US today are fleeing from violence that the US fomented in our fight against communism and the War on Drugs in Latin and South America. Approximately 200 Panamanian civilians were killed during the US invasion of Panama and Operation Just Cause under George H.W. Bush. Estimates of civilian deaths during Desert Storm range from 2,300 to more than 3,600. In the War on Terror, we have no idea how many dead, and we have no desire to know, because the number would be so shaming and would likely inspire more terrorism against the US. Maybe 4 million or more. Plus under George H.W. Bush, military excursions into Liberia, Zaire, Sierra Leone, Bosnia and Herzegovinia, and Kuwait. Under Clinton, Bosnia, Somalia (where 18 Americans were killed, 1 was captured, and 73 were wounded), Macedonia, Haiti, Central African Republic, Kuwait, Albania, Congo, Gabon, Sierra Leone, Cambodia, Iraq, Afghanistan, Sudan, Liberia, East Timor, Serbia, and Kosovo–but, somehow, not Rwanda. Under George W. Bush, Sierra Leone, Nigeria, Yemen, East Timor, Yemen, the Philippines, Georgia, Djibouti, Kenya, Ethiopia, Eritrea, Somalia, Haiti, and, of course, Iraq and Afghanistan. Under Obama, Iraq, Afghanistan, Yemen, Libya, Pakistan, Somalia, Uganda, Jordan, Turkey, Mali, Syria, and Cameroon. Under Trump, we continue to maintain 1.3 million US troops abroad, including in Iraq, Afghanistan, Ukraine, Kuwait, Syria, Poland, and South Korea. And, of course, at home: those who died of complications related to HIV due to government inaction during the Reagan/Bush years. Mass incarceration under Clinton. Rising hate crimes under Trump. 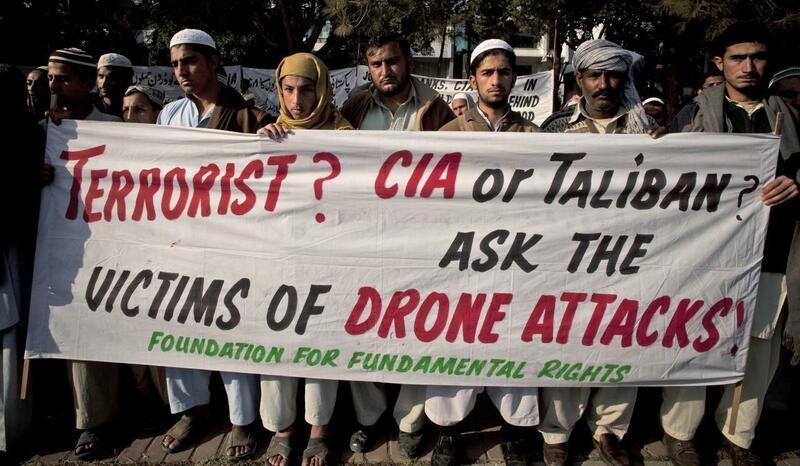 Below, Pakistani protestors remind Americans of the link between US-led killing of civilians via drones and terrorism. US presidents could care about human rights of the world’s most vulnerable people. If not, they are responsible for understanding that violence breeds terrorism, not security. When a president dies, we invoke how “complicated” the presidency is. True. And you probably have to be a bit of a narcissist who is disconnected from reality to be able to withstand the pressure of getting the job. But it’s not “complicated” to engage in warfare that takes civilian lives 90% of the time. I’d trade four living American presidents for the millions of brown-skinned civilians whose deaths they caused. In an instant. Of course. And so would the millions of enemies we made worldwide through our violence. It’s the first day of finals week, which means I am getting roughly 6 emails per second from students who have just realized that they missed some key piece of information that I have shared with them no fewer than 9 times: in the syllabus, on the quiz over the syllabus, in the video of my explaining the syllabus that they can re-watch any time, in the transcript of that video, in the assignment, in the rubric to the assignment, in the announcement I put into our learning management system reminding them of the assignment, in the follow-up all-class email I sent to the whole class reminding them of the information, and, finally, two hours before the assignment is due and when I see that they still haven’t done it, in the targeted email reminder to all students who still have turned it in. Screenshot the spot in the directions/syllabus/rubric that you are confused about, then send me the screenshot with your question about it. That way, I can make sure we are looking at the same document and are on the same page when I answer your question. You can screenshot something on a Mac using Cmd+Shift+4; on a PC, use the snipping tool. Attach is here using the paperclip icon, or paste it directly in the email. Most of the time, when a student is reminded that they have all the skills they need to answer their own question, they do.Only sometimes do they have a real question. And sometimes they have discovered an inconsistency in the syllabus, which I, of course, want them to draw to my attention so I can fix it. What is most common is that, in their question, they are asking, “Am I okay? Is this going to end well? Do I belong here? Can I do this?” They need my reminder–in the form of taking their question seriously but also in helping them remember that they can navigate college expectations without my direct intervention–that they are worthy of their place in the classroom. That’s the real lesson they need to learn, and it’s my job, especially as a teacher at a public university serving mostly first-generation students, to teach it, even amid the busy-ness of finals. December Writing Challenge Starts Today! Whether you are already a fantastic, productive writer who can’t wait to get to your manuscript each day or you are stuck or struggling with half-done manuscripts, a backlog of pieces in your “to-revise” pile, and a feeling of dread when you open your computer each day, you are invited to join the monthly AGT Writing Challenge. Each month, participants agree to write at least 400 words per day for 5 days each 7 day week, Sunday through Saturday. We start on the FIRST Sunday of every month, and since there are no breaks between monthly challenges, we are usually ending in the following month. If you meet your goals, you will write at least 8,000 words in a month with 4 weeks and 10,000 words in a month with 5 weeks. For December, we start on Sunday, December 2 and write through Saturday, January 5. That’s five big weeks of writing–so our goal is 25 days, which will produce a total of 10,000 new words. Are you an academic writer worried about how finals and break will affect your productivity? Writers in the AGT writing challenge have shown over and over again we can write even when we have a lot of other obligations–and, in fact, we often enjoy those other obligations more when we meet our commitment to write. December is a great time to take time for yourself and your own writing goals. You write 5/7 days each week, at least 400 words. Each day that you write, you send your writing to me at anygoodthing@outlook.com with the word count in the subject line. If you meet your goal for the month, you get your $20 back. If you miss a day, you lose $3. If you miss 2 days, you lose $6. If you miss more than 2 days, you lose the full $20. Forfeited funds go into a kitty that funds a small monthly prize, drawn at random from among those who meet their 20-day goal; occasional random drawings among participants for other contests; and administrative costs associated with organizing the AGT Writing Challenge. From the email address you prefer to use in our correspondence, email me with your name, the email address associated with your Facebook profile (so I can add you to our Facebook group), and how you plan on paying (PayPal or check). If you’d like an accountability partner, please let me know in email. Send any other information you think is important and any questions you might have. While you can email me your intention to join and put in your $20 at any point, each AGT Writing Challenge begins on the first Sunday of every month. You may join up to two days after the start date but those two missed days will count as your skip days that week, so you’d need to write Tues-Sat of that first week to meet your goal. After the first Tuesday of a month, it’s too late to join for that month, so you’d need to join in the following month. Each challenge runs for four or five weeks–until the next month’s first Sunday. Participants include professional writers, those writing after a hiatus, and people coming to writing for the first time. Some people are working on professional projects, while others are working on personal ones. Our writers are working on novels, short stories, academic articles, academic books, dissertations, blogs, religious devotionals, memoirs, and more. What can I write about? Can I work on more than one writing project? You can write about anything you like. Some folks work on one project the entire time they participate, while others switch between ongoing projects on a regular basis–sometimes even within the same day. The AGT Writing Challenge is a good opportunity to work on writing that you might avoid otherwise–a spot in your novel where you are stuck, an academic article that has been languishing, or a short story that you think could be good if you’d just revise it. Do you read my writing? No. If you send your writing within the body of an email, I’ll see the first few lines when I open the document, but I don’t read it. If you send your writing as an attachment, I don’t open it except to do a word count if you’ve not included a word count in the subject line. How does the AGT Writing Challenge support my writing? In addition to regular email check-ins, you can participate in our secret Facebook group, where writers share inspiration and advice, ask questions, and support each other. If you like seeing your daily writing total add up, you can check in with our Google Sheet, an online spreadsheet where you can self-report (using your real name, initials, or a pseudonym) your daily writing progress and see how your efforts are comparing to others in the group. And you can request to be paired with an accountability partner from the group. How do accountability partners work? On the first day of the new Writing Challenge, I’ll share an invitation on FB for folks to request partners, and we’ll use the space there to match folks. If you want a partner but don’t use FB, just email me and let me know that you’d like to be matched. You and your partner are matched for the whole month, with new partners reassigned each month. You should figure out how you want to check in with each other (FB Messenger, text message, or something else ), how often (daily, M-F, every other day, etc. ), and what you want to do in those check-ins (Sometimes a regular, specific question works well: “Did you write for that grant project you have due soon?” “How many words did you add to your chapter today?”). writing faster as they get in the habit of writing daily, so those 400 words come faster and faster as you keep at it–giving you more time to write more words! When you overcome a writing obstacle–whether that’s a technical difficulty in writing, a plot point you’ve been struggling with, a piece of data you couldn’t explain, a bad habit (like interrupting yourself to check email), or something else–you become more confident that you can overcome the next difficulty. And the AGT Writing Challenge is rooted in respect for writing, encouragement (rather than competition, which is, unfortunately, the situation many of us face at work), and the belief that we all lose when good ideas are lost–and when good thinkers don’t get their ideas out there. What if I’m writing something I can’t share? If you are working on a large project that can’t be shared due to privacy concerns, it’s probably not a good pick for the AGT Writing Challenge. However, if you must occasionally write a piece you can’t send in (a faculty review, a review for a book proposal, etc. ), just send the word count and a note explaining what you worked on. What do you do with the writing I send in? I keep it in my dedicated AGT Writing Challenge email account for the duration of the month. Depending on the number of writers, it may take me up to a week to contact everyone to let them know if they met their goal for the month. After that, I usually wait about 3 days, just to make sure that I didn’t get anyone’s individual tally wrong, and then I delete the emails that contain your writing. How long do people stay in the AGT Writing Challenge? Some folks participate for just one month. Others pop in for a month, then take a month off, then come back. Some have participated every month since they joined. Stay as long as you like–and come back whenever you need to. Do I have to be producing new words each day? Figure out about how long it takes you to write 400 words. Use time, not word count, as a measure. If 400 words takes 45 minutes, then 45 minutes of editing or revising or producing a table can equal 400 words. Consider the larger project. How many pages is it? How soon do you want to have it done? If, say, you are proofing the galleys on a 200 page novel and you want to have it done in 5 days, you’d need to proof 40 pages per day. Find a ratio that you think reflects your efforts. Many people measure revising as 1/2 or 1/3 the “value” of new words–so, for example, you would need to revise 800 words to equal 400 new words. Don’t count revised words. This, obviously, is the strictest measure, and it might be right for you if you are a person who uses revision as a form of procrastination. If you have other strategies, suggest them! And feel free to experiment with different strategies until you find one that works for your needs. Do you offer proofreading, editing, coaching, or writing services? I do, and you can read about them here. And if I’m not available or not a good fit for you, I’m happy to recommend other editors or writing coaches. I’m a student. Would you write my paper for me? No, but I will contact your academic dean, your advisor, and the instructor of the class and let them know you asked. Where did the idea for this Writing Challenge come from? A few years ago, I applied for IRB approval to do something like this as an experiment in an online course. My university denied it, saying that the project was too much like gambling. The state’s Department of Finance and Administration (which oversees lotteries, bingo, and games of chance) disagreed, and I argued with the decision, citing a body of literature on similar projects on smoking cessation and weight loss, but the IRB committee was adamant–anything remotely like gambling was off limits. (Those in higher ed in Arkansas might see a joke in here: the state’s lotto funds higher ed scholarships.) But I kept thinking about the idea and eventually decided to apply it to one of my other interests: supporting writers. We often get stuck thinking that the only way to progress is through criticism. I disagree. Personally, I’ve never once improved because someone tore me apart; I’ve only ever really improved when I felt confident and when others saw potential in me. I figured I wasn’t the only one, so a project like this one might work for other people, too. And if it chips away at a culture of humiliation, that’s a bonus! At the heart of this model is the idea that we can all succeed, that there is room enough for everyone’s ideas, and that we are not in competition for scarce resources but that the more of us in the conversation, the more opportunities we have to develop our ideas. What motivates you to host this event? Previously, I’ve directed Women and Gender Studies at Arkansas State University and worked as a dissertation and thesis coach at the University of Kansas. In both roles, I saw my work as helping others build their capacities for writing and research. I love that kind of work–encouraging others, supporting them as they move forward. I’m especially passionate about helping those traditionally underserved by higher ed, including women, first generation scholars, and people of color. Hosting this been a lot of fun for me so far and encouraging in every way. I’ve cleared off lingering projects, moved new ones forward, got to experiment with new forms, learned a lot about myself as a writer, and reminded myself of why I got into academia in the first place (because I love writing! and I love seeing people succeed in their writing!). And, seriously EVERY SINGLE DAY I get to see AGT writers all bringing new ideas into the world!